Don’t believe the rumors! Absinthe is perfectly legal and does not make you hallucinate. There are special absinthe glasses and spoons, but you don’t need to buy special utensils to serve absinthe in this traditional method. You may see an absinthe fountain with drip spout at bars or events achieving the same effect as you’ll get from following these instructions. 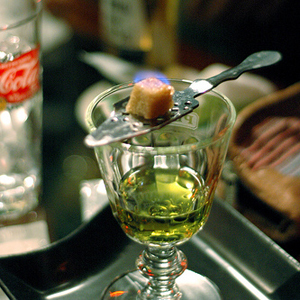 Pour one shot (1.5 oz) of absinthe into an absinthe glass or stemmed glass. Take one sugar cube and put it on top of an absinthe spoon or a slotted tablespoon or fork. Put at least 4.5 and up to 6 oz. of cold water in a container with a slow-pouring spout. Pour the water as slowly as possible over the sugar cube to dissolve it. The absinthe will become cloudy–this is the desired effect. The exact amount of dilution through water is a matter of personal preference, but 4 parts water and 1 part absinthe is typical. Let it rest for a few seconds, then stir.